At the time of this writing, the number was estimated at around 970,864,745, and increasing by about 2 websites per second (Source: http://www.internetlivestats.com). According to Internet research company Netcraft, as of this past spring there were around 177 million active websites among the hundreds of millions of existing hostnames. Hosting these hundreds of millions of websites are hundreds, by some counts thousands, of hosting service providers that use servers all over the world. Smaller businesses and folks with personal websites–for whom the hassle and expense of purchasing, setting up, and managing a server is both unnecessary and lacking in benefits–have been taking advantage of off-site hosting from the beginning. However, some larger companies that for years opted to keep their websites on on-site servers or servers in private data centers are starting to move more and more of their computing, including their sites, to third-party data centers – the migration to the cloud. The result? A huge upsurge in the number and size of data centers worldwide. In November of this year, research firm IDC reported that it expects the total number of data centers of all types (which would include private data centers of large corporations) to peak at around 8.6 million in 2017. By 2018, it says, large data centers like the ones highlighted in the map below will likely account for more than 72% of all service provider data center construction in terms of space worldwide. (Source: https://www.crn.com/news/data-center/300075706/the-2015-data-center-100.htm). So where are these giant data centers located? 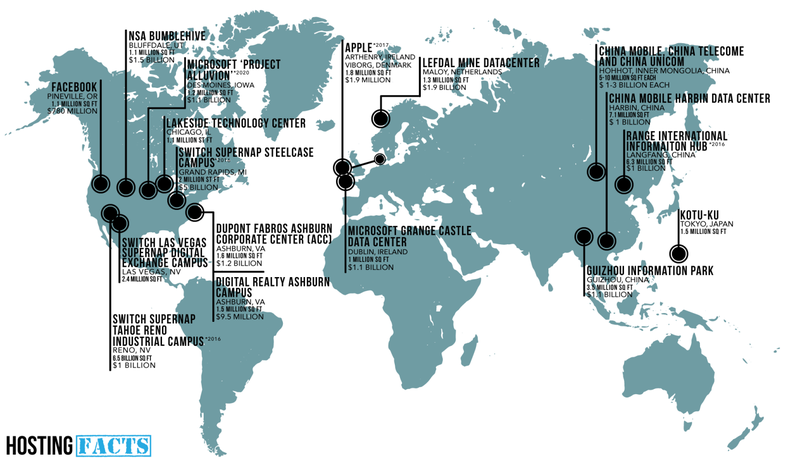 Here, we map out some of the biggest data centers, current and upcoming, around the world. Now, data centers can be hard to compare, as some are essentially just buildings full of servers, while others include office, convention, and sometimes even living space. Plus, new projects are announced every few months, each seemingly bigger and better than the last. Nevertheless, we think the map gives a pretty good idea of the world’s hosting hot spots and just how much is being invested in creating them. One of the things we noticed in compiling the stats for the map is that the data centers coming online in the next few years dwarf even the largest built over the past decade. For the longest time, facilities like the Lakeside Technology Center in downtown Chicago and Switch’s SUPERNAP facility in Las Vegas held court as the largest facilities in the world at more than 1 million square feet each. Their nearest class of competitor usually clocked in at around 400,000 – 600,000 square feet, which was also considered pretty impressive. These days, facilities with less than a million square feet don’t even make the map. Data center projects now in the works involve campuses of several buildings totaling in the millions of square footage, with flexibility to add even more structures as demand increases. But it doesn’t stop there. The map doesn’t really reflect places like Data Center Alley in Loudon County, VA, where favorable infrastructure, location and local incentives have created a sort of data center vortex. According to the Loudon Office of Economic Development, as much as 70 percent of the world’s internet traffic flows through Loudoun’s data centers each day. While this may seem a bit steep at first, it becomes a little more conceivable when one considers that such traffic hogs as Facebook, Microsoft and Amazon all rent or own data real estate in the area, along with 3,000 other technology companies. The area’s largest facilities – the DuPont Fabros Ashburn Corporate Center (ACC) and the Digital Realty Ashburn Campus – are among the largest data centers in the world (for now), but the area houses more than 60 such facilities, with more than 9 million square feet of space that is growing every day. A similar cluster of data centers has sprung up in Hohhot, Inner Mongolia, where China’s leading telecom providers are building mega centers by the millions of square feet. Of course, not all of this space is used to host websites. Some of them are used to provide business services, storage, cold storage, and anything else computers can do. While China may be remaking the envelope when it comes to data center complexes, the U.S. holds the largest share of the market when it comes to website traffic. A recent report from W3bin.com, which monitors the hosting of existing domains, indicates that 44.6% of the top 100,000 most visited websites are hosted in the U.S., followed distantly by China (9.2%) and Germany (6.3%). The most popular city for popular websites? Phoenix, AZ, another hotbed of data center activity where big names in the data business (CyrusOne and Digital Realty Trust to name a couple) and popular web hosting service GoDaddy make their homes. Location, location, location. Also power. Data centers, especially big ones, are expensive to build and to maintain. They require complex cooling and networking systems and draw enough energy to power a mid-sized city. They have to be secure and reliable and built to allow for flexibility as customers’ needs change. Their locations, then, have to take into account, among other things, the costs of electricity, land value and the distance data will have to travel to get where it needs to be. Consider: The New York Stock Exchange measures data transfer speeds in sub-milliseconds. Data centers that serve customers who expect and depend on this kind of instant information have to be located as close to the user as possible–usually closer than 50 miles, which often means they have to be built in costly urban areas. However, even traveling over hundreds of miles, data transfer speeds are generally measured in fractions of second, making it possible to build data centers for the rest of us in some of the unlikeliest places. Switch’s Supernap facility in Las Vegas, for example, is only 7 milliseconds from Los Angeles, 270 miles away. Facebook, which maintains several data centers around the world, chose to build one of its server farms at the edge of the Arctic Circle in Northern Sweden. The location allows the facility to take advantage of hydroelectric generators for power and always-on Arctic air for cooling, making it one of the most energy-efficient data centers currently in use. Other data center developers are also exploring ways to use green energy to power these high-consumption facilities, not only to reduce their impact on the environment, but to lower the cost of running them. 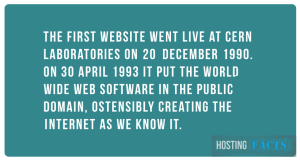 Over the past few years the word “website” has come to mean so much more than it did back in 1993 when CERN first put the “world wide” in world wide web. As we finish up this article, the total number of websites in the world has shot up to 970,867,302. By the time you read it, the count will easily have risen by at least 175,000. By next year, data centers with only 1-2 million square feet of server space will most likely have dropped off all the lists of the world’s largest data centers. Several more data center Edens like Loudon County, VA, and Hohhot, Inner Mongolia, will have sprung up, probably in some surprising places. Infrastructure as a Service (IaaS), Platform as a Service (PaaS), and Software as a Service (SaaS) will inevitably come to dominate the market by the end of the decade, making data centers the lifeblood of business. In a world where your website can be your whole livelihood, it is more important than ever to be able to identify the best website host and stay informed about how they’re measuring up and how their infrastructure works.